Following a preliminary time of discernment as a postulant (around 1 year), the first stage of formation is the novitiate (lasting between 18 and 24 months). During this period the novice receives the habit and his religious name. 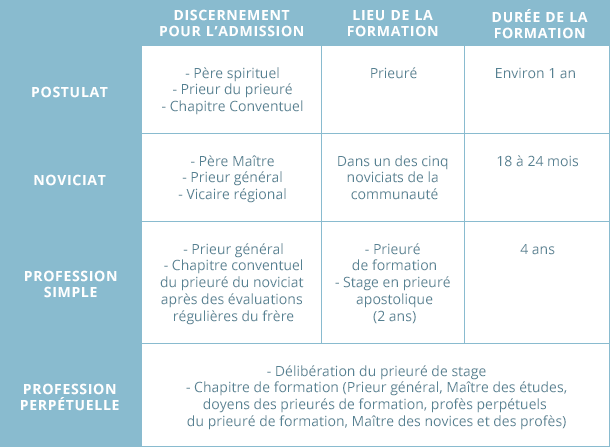 The third stage is simple profession (for at least 4 years), during which a brother lives in the priories of formation in Saint-Jodard and Rimont, France but it also always includes a placement of 1-2 years in an apostolic priory. At the end of this period, his vocation having been confirmed, the brother is able to take his perpetual vows. For those called to the priesthood, as is the case for the majority of brothers, ordination always takes place after the brother has pronounced his definitive, perpetual vows. Throughout his initial formation a brother benefits from the personal accompaniment of those responsible for his formation. They help him to discover the charism and life of the religious institute, and they help him to discern whether or not to continue freely along the path to a definitive commitment. In order to guarantee the brother’s interior freedom and openness of heart, this accompaniment is undertaken in ways that are distinct according to the external forum (teacher, prior) and the internal forum (spiritual director, confessor). Studies are undertaken in accordance with the Charter of Studies (Ratio studiorum) adopted by the French Bishops’ Conference for the preparation of candidates for the diaconate and priesthood. They include courses in philosophy, theology, pastoral care, canon law and also social sciences such as the history of the Church and psychology. More specific formation is provided in relation to emotional and sexual maturity and the prevention of abuse. The brothers who teach and the professors who come from outside the Community all give their classes in the studiums of philosophy and theology. In addition, it is possible to pursue university studies outside of the Community and to receive a state or canonical qualification. Who are the professors for the different stages of formation? The professors who teach in the Brothers’ centres of formation have either a State or Canonical qualification. They are made up of Brothers or Sisters of Saint John, laypeople, diocesan priests and religious from other communities. Whether studying philosophy, theology, or other subjects such as exegesis or psychology, the student brothers thus benefit from a wide variety of complimentary expertise. Is our formation transferable to a university course? The School of St John is a private institute of formation where the Brothers study primarily philosophy and theology. This institute does not yet offer a degree that is officially recognised by other universities. However, Brothers and Sisters of Saint John who have completed their formation here are regularly accepted onto the first year of a Masters’ degree programme at various universities. The studium of philosophy is in Saint Jodard, France (Département 42). The studium of theology is in Rimont, France (Département 71). Postulancy lasts for approximately one year. It is a time during which the postulant discovers our life and discerns whether he wishes to ask to enter the noviciate. Depending on the country, the postulant either lives in one of our priories or is involved with a priory whilst being resident elsewhere. When a postulant is resident in a priory, he participates in the life of the Brothers. He meets regularly with the brother responsible for postulants and with a spiritual director of his choice. He also receives an introductory formation. When a postulant is unable to be resident in a priory, he follows a programme of meetings and opportunities to experience life in the priories as well as monthly formation. He is accompanied by the brother responsible for postulants and by a spiritual director of his choice. In this way he is able to continue any studies he may be doing or any professional activities. Should he wish to ask to join the noviciate, he will undertake a retreat for vocational discernment. How are religious names chosen? A religious name is given to a brother at his clothing (when he receives the habit), half way through the noviciate. The novice himself suggests three names from which the superior choses one. The monastic tradition of changing one’s name expresses the fact that by entering religious life the baptised person embarks on a new path in the footsteps of the Lord.